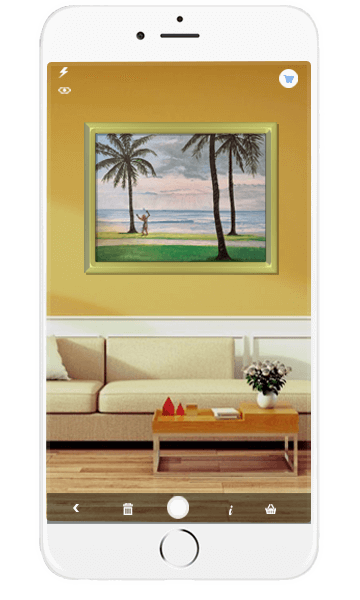 Now you can decorate your home like a professional with http://wrinkleart.com augmented reality app. Whether you have a new home or just want to accent a room, our AR app will allow you to decorate your home before you buy. The AR app helps you to determine whether a piece of product will fit in a space, or will go perfectly with your existing room décor. It allows you to see how product actually looks in your house before you decide to buy, which makes you look like a real pro! Once you browse through our unique collection, you can design your home by simply using our app on your smartphone. You would point your phone where you want to place the product and the app will overlay the image into the space thus making it look real. The app also automatically scales items to real dimensions. Get our Augmented Reality 3D* App by LIVEb4buy! FREE. It is available on the App Store and the Android App on Google play. Download it on your smartphone and have fun decorating! * – 3D Visualization is available for the available models only. But 2D models as well fit in your room with the measurements using iOS #ARKit . Android #ARCore is in Development. You can visualize the AR App without the dimensions in Android Mobile for now. Que :iTunes asks for payment on downloading LIVEb4buy app?